Join veteran Brooklyn tour guide Norman Oder on a briskly-paced, wide-ranging introduction to the neighborhood, including historic blocks, converted historic buildings, commercial corridors, religious institutions, parks, and civic buildings. The tour will touch on industrial history, immigration (notably Greenpoint’s enduring Polish presence), and the current (and future) signs of gentrification. This event is co-sponsored by Preservation Greenpoint and the Emerging Conservation Professionals Network of the American Institute for Conservation (AIC). The tour is free, but space is limited. We will meet near the Greenpoint Avenue stop on the G train (exact meeting point will be sent upon RSVP). Please RSVP to info@preservationgreenpoint.org to reserve your spot! Join Historic Districts Council and Preservation Greenpoint for a tour of the Greenpoint Manufacturing and Design Center’s private flagship building (1155-1205 Manhattan Avenue) on Tuesday, October 6 from 11-12:30pm. This extraordinary place has a rich history as one of the last surviving and only active manufacturing buildings along the industrial North Brooklyn waterfront. The 8-building, 360,000 square feet manufacturing complex was constructed between 1887 and 1903 by Chelsea Jute Mills, a rope manufacturing company. The complex functioned as a textile factory between the 1930s and 1950s until it began leasing space to small woodworking and other manufacturing businesses by the 1970s. After narrowly escaping demolition by the City in the 1980s, the complex now functions as an industrial center for 75 small and mid-sized manufacturing businesses. The tour will include a walkthrough of the building’s interior in addition to a glimpse inside the workshops of three businesses. Cassandra Smith, GMDC project director, will lead the tour and discuss the building’s history and adaptive reuse. 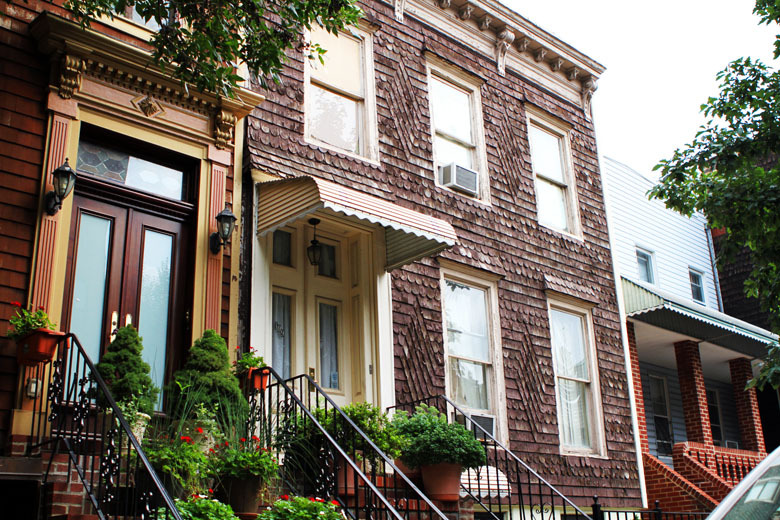 After the tour of the Greenpoint Manufacturing and Design Center, continue your exploration of historic Greenpoint with a walking tour led by Matthew Coody, co-founder of Preservation Greenpoint. The brief walk will focus on Franklin Street, the neighborhood’s original commercial core. This area still features wonderful examples of commercial, residential, and industrial architecture despite rapid changes to the neighborhood. Highlights will include the Astral Apartments, the Eberhard Faber Pencil Factory, and the Art Moderne Harte & Company Building. 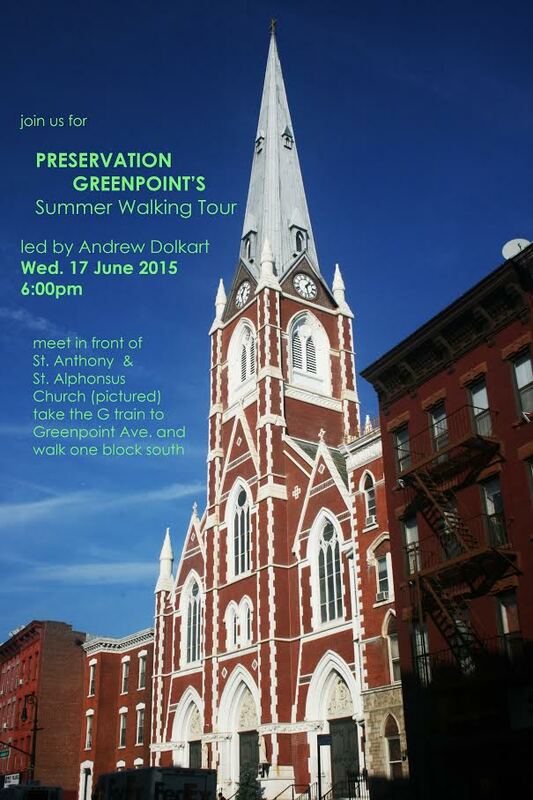 Greenpoint Walking Tour, June 17th! Join us for a walking tour led by professor, author, and architectural historian Andrew Scott Dolkart (who is back by popular demand!). The group will explore the architecture, history, and development of Brooklyn’s Greenpoint, from the industrial heritage that remains as a reminder of the neighborhood’s role as a powerful industrial center, to the delightful array of residential structures in a wide variety of styles. Don’t miss this opportunity to learn more about Greenpoint from one of New York City’s preeminent architectural experts! The tour is free, but space is limited; please RSVP to ensure a spot. 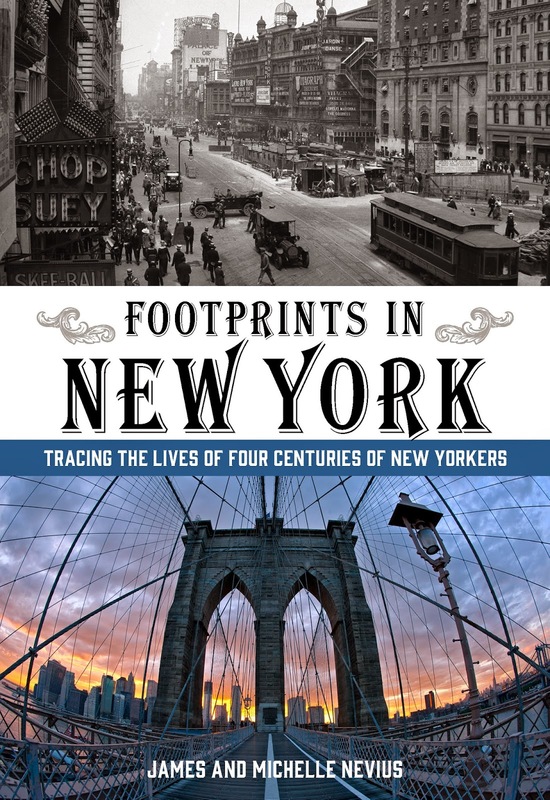 Sunday, June 29th, 4:00 p.m.
From long-forgotten politicians to the movers and shakers of Gilded Age society, James and Michelle Nevius, authors of Footprints in New York, will discuss the lives of iconic New Yorkers, then lead a walking tour of historic points in the neighborhood. Cosponsored by WORD Bookstore. Facebook RSVP requested but not required. Better Late than Never: Photos from our Wooden Houses Walking Tour! Saturday, November 9th, 11:00 a.m. – 12:30 a.m.
Greenpoint is more than a neighborhood of lofts, galleries, and the best pierogies in Brooklyn. It’s also home to some of our favorite wooden houses! Join Chelcey Berryhill and Elizabeth Finkelstein of the Wooden House Project for a walking tour up, down and all around the unique wooden-house filled streets in this historic area. Learn about how these hearty survivors came to be, their ties to Greenpoint’s early shipbuilding history and how they’re being rediscovered and brought back to life today. Reservations required; meeting place will be given upon sign-up. Check out our “Six to Celebrate” Tour!